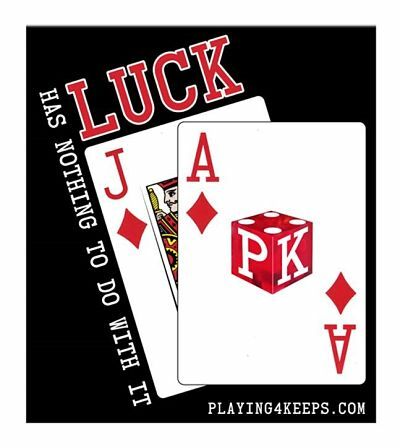 Playing 4 Keeps is more than an gambling experience, it's a lifestyle. When it comes to winning and losing, both coexist and both are valid and necessary. As a fisherman, I did not catch fish every time out, though my love of fishing never waned. Not catching fish did not stymie my passion for fishing. The challenge of outsmarting a fish motivated my passion. During a losing streak, the focus needs to be on the challenge, not the losing. Don’t Look at the Wall! The man speaking, during a motivational lecture, was a professional race car driver. “At a speed of 133 miles an hour, going into a turn,” he said, “don’t look at the wall. If you look at the wall, you will hit the wall. The car goes where your eyes are looking. Don’t look at the wall.” I think this wisdom also applies in a game, when losing. Keep your focus on what you want, not what you don’t want. If losing is part of the game, then is the risk of losing the motivation to win? If not for the challenge of avoiding the loss, why play the game? Winning involves the thrill of overcoming the challenge, strategizing, playing smarter, and figuring out the puzzle for success. Isn’t the journey to success the experience we relish the most? Doesn’t this hold true for any challenge in life? Play for the thrill of a challenge, or you might as well be playing checkers with an eight year old. I keep a record of all my casino sessions. Keeping a journal enables me to follow the evolution of my game. A good record can provide the clues that lead up to a losing streak. In other words, the answers to a slump may be found within the pages of the journal. The hard part may be taking an objective perspective when reviewing the record. During a losing streak it is natural to be to self-critical, but you must resist being too critical. Remember, you have worked hard to become an advantage player. You know the difference between greatness and mediocrity. No one wants to settle for less than a win, making it imperative that you avoid becoming demoralized if you experience a string of losses. Playing demoralized is the worst feeling, when attempting to overcome a game with odds against you to win. It is like filling your pockets with sand before going for a swim. So, what is my suggested remedy for a slump? Some say that you should play through a slump. This may work if your bankroll and ego can finance a losing streak, along with an emotional whack in the mouth. I am sure that there is merit to this idea. Nothing like a smack in the chops to wake up and fly right. I suggest to push the stop button and look for the “log jam” that has stuffed up the machine! Here are just a few typical examples of events that can trigger a slump: consumption of alcohol, playing under bankrolled, playing too aggressively, playing for too long, over betting the bankroll, chasing a loss, playing while emotionally or physically stressed and playing in denial of the fact that you are in a slump. The key to these behaviors is identifying the triggers. Your life is reflected in the energy of the game. Somewhere, there is a wobble in the force. If you look for it, you will find it. Perception of the wobble provides the “heads up” that you may be playing out of control. Playing out of control could be a sign of physical or emotional instability somewhere in your life. Can’t I Just Take a Pill? What is the cure? I am not sure that there is one specific cure that is appropriate for every player, but here’s what I do first when I am in a slump. I back off the game and examine my journal. I also contemplate my physical and emotional state during the time of the slump and prior to the slump. Next, I validate what I am feeling. What does the energy feel like? How does it influence my feelings for winning and losing? When my perception is in agreement with the “money flow”, I know that my perception is dialed in. When I am dialed in, I take heart knowing that an important aspect of my game is intact. If I am not dialed in, then I know I am “off” and accept that I am off. No point in “forcing a square peg”. Once I have recognized that the game’s results are contrary to my perception, I accept that my most important skill for winning, my intuition, has been crippled. I need to re-boot. Self-honesty in a gambling scenario may be rough to accept, at least until you learn emotional detachment. Watching is the easiest way to play the game and be emotionally detached. Since there are no bets at risk, there should be nothing to influence decisions emotionally. With this clarity, your focus can be on the direction of the game and how it plays out energetically. You cannot possibly lose from the experience of watching. It is a free education, right or wrong. Your intention is focused unselfishly and without bias. Since you are detached from your own needs and desires, you are more likely to channel perceptions more clearly, without the pressure of having money at risk. Impartially, you will discover if your perception of the game’s energy is true and correct. As you witness the game’s results, it provides you with immediate and honest feedback to confirm whether your perception is “on” or “off”. Incidentally, there is no right or wrong. There is just a confirmation about your perception being aligned with the energy of a particular experience. Sometimes you will be “right on” and other times you may find yourself in “right field”. You must be emotionally detached to accept the truth of the present moment. Otherwise, you force your perception to fit what you want, rather than accept what is truly happening. I am talking about denial. If you find that you are losing in more than one casino game, this is a bigger problem. You must discover the leaks in your games by sourcing the “messages”, to find the answers to your losses. Solving the puzzle becomes your “new game” to play. “Get yourself out of the handcuffs Houdini!” It’s not magic. You are challenged to review your life and analyze the metaphors appearing in your life. You end a slump by locking in small wins. Any win is a good win. Your goal is to rekindle your confidence. Limit yourself to fewer and shorter sessions. It all starts when you employ courageous self-discipline. You must “lock-in” the first win and walk away with the profit. The subconscious mind needs to experience the win, no matter how small, confirming that you are back to winning. Experiencing a losing streak happens to most players. Winning and losing are just reflecting the highs and lows in life. It is an outward expression of the spiritual energy, no praise, no blame. It means life changes as our energy changes. It means you can have choices and can be in control of your life. Nothing lasts forever and a shift in energy can take place in the blink of an eye. Change means you have something new and exciting to learn. It means raising your energy to pull out of a slump. Once you figure it out, you will project a bigger energy expressing that you are playing for keeps. 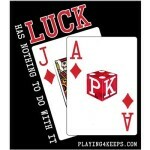 Share the post "Losing a Losing Streak"
Luck has nothing to do with it when you are Playing 4 Keeps! Copyright © Playing 4 Keeps™ 2016 All rights reserved. No part of this web site may be reproduced or transmitted by any means, electronic or mechanical, including photocopy, recording, or any information storage or retrieval system, without permission in writing from the author, Michael Vernon.